Note: This should have been a Product Meeting summary for week #42 2018. Unfortunately, my PC blue screened on me, some 45 minutes into the meeting, and I lost all audio to that point. As such, these notes focus only on the licensing / permissions changes as reported in the official blog, with some additional notes from the meeting. All items uploaded prior to the R26 Thumbs Up release are re-designated “Unlicensed” objects. Unlicensed items will once again be editable as they were prior to the R26 release. This includes editing values in scripts, editing materials and all other object properties. Unlicensed items can be combined and saved back to inventory, but they cannot be uploaded to the store and sold. All items uploaded after the R26 deployment are designed as “Licensed” objects. 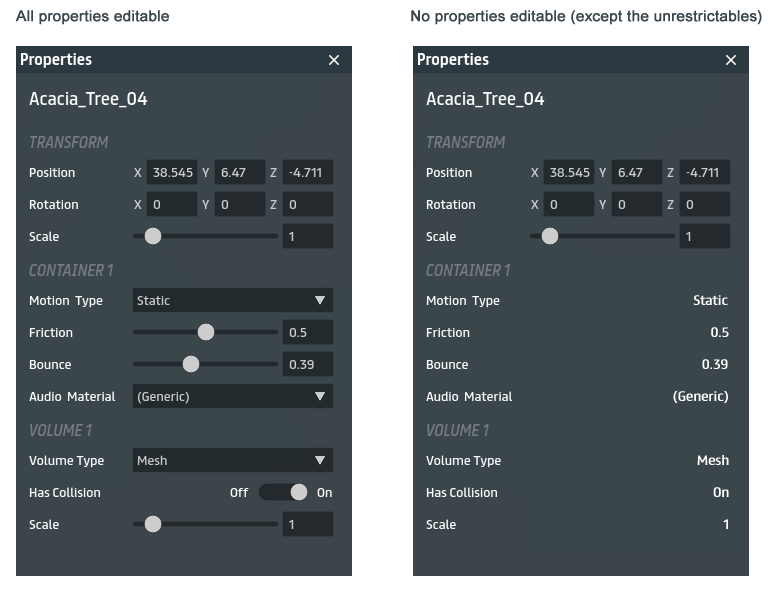 These will have fully editable properties – including materials (so items no longer have to be set to Full Permissions in order to have their materials editable). Unlicensed items can be combined with Licensed objects (e.g. an unlicensed script can be included in a licensed object) and saved back to inventory. However, the combined object cannot be uploaded to the Store for sale. These changes will come into effect with a Sansar point release due on or around Thursday, October 18th, 2018. An important point to note with the changes is that all objects uploaded since the R26 release will, by default have materials editing enabled by default as Licensed objects. Therefore, those items for which the creator does not wish to have materials editing enabled will have to be modified after the update has deployed. The official blog post on licensing also includes an FAQ that was a WIP at the time of writing this update, therefore please refer to that post for further updates. There will be a further licensing / permissions update (most likely R28 in November) to surface what is, and what is not, an editable parameter on an object.or combined object. As a reminder: all of the above, and the licensing / permissions system in general, only applied to “in scene” objects, Clothing and worn accessories are currently not a part of the licensing / permissions system, but will be added in the future. To become Licensed products, any objects uploaded prior to R26 must be re-uploaded into order to enabled the ownership / license tracking on it. We are one of the oldest, grunge style, residential estates in Second Life. We feature opt-in community run role-play and events. Our themes range from the supernatural, to everyday urban life. I can vouch for the World of Soap, designed by Loch Newchurch having been around a good while, having first visited it in August 2013 – although I didn’t get so far as writing about it. So my thanks to reader Mili Miklos dropping me a line about it and jogging my memory; the note allowed Caitlyn and I to rectify things with a further visit and (for me at least) the chance to get re-acquainted with this immersive role-play environment with its supernatural / dark tones. Founded by Lock Newchurch, the community covers two regions: the township of Missing Mile and the rural Soap National Park. Both are designed to be set within North Carolina, USA, and the national park includes a reservation for the Oconaluftee Cherokee. Both regions have their own unique character, and are linked via a road tunnel one to another. Unlike most role-play regions, World Of Soap is opt-in, not opt-out. This means visitors are free to roam the town and the park to get a feel for things while those wishing to engage in local role-play are asked to wear tags to indicate they are players. Given the supernatural theme to RP, it is open to a number of character types beyond human. These are: infected / zombies; vampires; witches / warlocks; animals; werewolves, and aliens (Greys); according to the website, the option to RP ghosts is “coming soon”. There are also a few character types that are not allowed, as they don’t fit the core role-play theme. These include furries, nekos and fantasy races such as elves. The core for role-play in the region is based on the books by Poppy Z. Brite (Billy Martin), the humour from which is also reflected with the regions, as noted above. A great place for fishing, camping and hunting but beware of the mysterious howls that can be heard late at night beyond the trees. Specially on the night of a full moon. The World of Soap website provides full details on character types, character creation and role-play rules for those wishing to join the community as players, so I’ll not delve into these further here. What I will say is both regions have a lot to offer visually, and present plenty of opportunities for photography, which is welcome within them. I cannot speak for the role-play, although during the three visits name in preparing this article, we did see some people wearing RP tags around the town. Caught under a foggy sky, Missing Mile has the run-down look of a grunge town that has seen better days. Even so; it is still a township – even if it does have the odd ghost walking the streets and spectres hovering in doorways. Under more open skies, the park offers walks and camp grounds to be enjoyed. However, both also include rental properties for those wishing to make their homes on the region, so do be careful around the houses, etc., to avoid trespass. Atmospheric, well designed, with the opportunity for role-play as well as offering a range of events (such as the pumpkin hunt on progress for Halloween), World of Soap is well worth visiting and exploring – and for those looking for new role-play opportunities, it might provide a home-from-home.